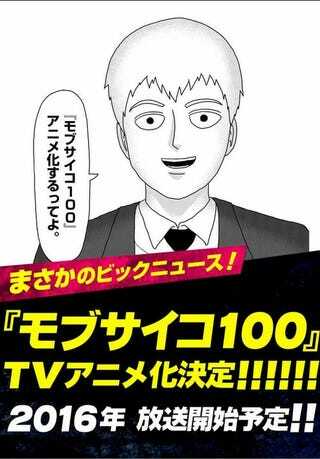 This news is a few days old, but in 2016 ONE’s Mob Psycho 100 is going to get an anime adaptation by studio Bones. If you’re enjoying this season’s One Punch Man you should prepare this to get excited for this show because it shares the same creator as OPM and it’s being made by a studio know for their excellent action. The story revolves around “Mob,” a boy who will explode if his emotional capacity reaches 100%. This boy with psychic powers earned his nickname “Mob” because he does not stand out among other people. He keeps his psychic powers bottled up so he can live normally, but if his emotional level reaches 100, something will overwhelm his entire body.